Miz Helen from Miz Helen's Country Cottage is having her annual Chili Cook-off. I've decided to enter this fabulous chili recipe, which comes from a cookbook that some dear friends gave me in 1996, called With Heart and Soul Among Friends. I've adapted this recipe to suit my tastes, and I hope you give it a try. Saute' chicken, red pepper, onion, and garlic in oil in a soup pot about 5 minutes or until chicken is just cooked. Add chili powder, salt, cumin and coriander; cook 3 minutes. Stir in beans, tomatoes and beer (or chicken broth). Bring to a boil. Simmer 45 minutes, uncovered, stirring frequently. Reduce heat to lowest setting. Stir in about 1 cup of shredded cheese at the end, or if preferred, garnish with the grated cheese. Make sure to serve some cornbread with your chili. You can find my favorite recipe here. Wouldn't you love a bowl of this Checkerboard Chili? I'll save some for you! 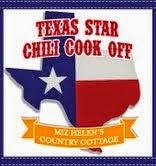 Make sure you visit the Chili Cook Off and tell Miz Helen "hi" from me! Mmmm... I would love to make this sometime soon. I don't chili with chicken very often, but this looks amazing, my friend. Hugs to you! Great minds on the same track!! We had white chicken chili last night...only it was Marie Callendars from a can. LOL Waaaay to spicy for us. Of course, I bought the BIG pack of 6 cans from Sam's Club. Duh? I'm taking it to a food pantry. Next time I'll make your yummy sounding recipe instead. Thanks for sharing it, Kitty. Your setting looks so inviting with the pretty candle in the background. I love chili, but it is so hot here it makes it difficult to think winter food just yet. We love chili to the moon and back but I've never heard of CHICKEN chili...no sir, us Texans have to have BEEF....hahhaa...actually, your recipe sounds wonderful and must try it. Oh, Kitty, this looks absolutely delicious! Love this recipe...a perfect recipe for a healthy, hearty, supper. Your Checkerboard Chili looks wonderful, I love the combination of flavor and the best of luck to you in the Chili Cook Off! Thanks so much for sharing your awesome post with Full Plate Thursday and have a great weekend! It was such a nice surprise to hear from you, Kitty. Thank you for your visit. I am pinning your chili recipe to try when it gets cooler again. We had a week or so of cooler weather and now it is hot again. I think you have a great chance of winning the contest. Your recipe sounds great. I love the chicken and various beans. Can't wait to try it myself. Kitty, this sounds delicious! I have never had chicken in a red chili, only in a white chili. I bet it is so yummy! Thanks for sharing with SYC. I would give anything for a bowl of this delicious looking chili right now Kitty! It's cold, gray and drizzly here in Carolina and this would be perfect. I can almost smell the amazing aroma! Hmmmm, good! Will have to try it. Thanks so much for sharing your Checkerboard Chili with The Texas Star Chili Cook Off 2014! You helped to make the Cook Off a great success and I really appreciate your entry, we would just love your chili it looks delicious.